Key to any great makeup look is a fantastic base. Like the wallpaper in a room or a body of a car, all the extra bits and bobs can be added on top to really personalise the end result – but if you start with a slightly lumpy wall or a rusty bonnet you’re only going to be able to achieve so much. 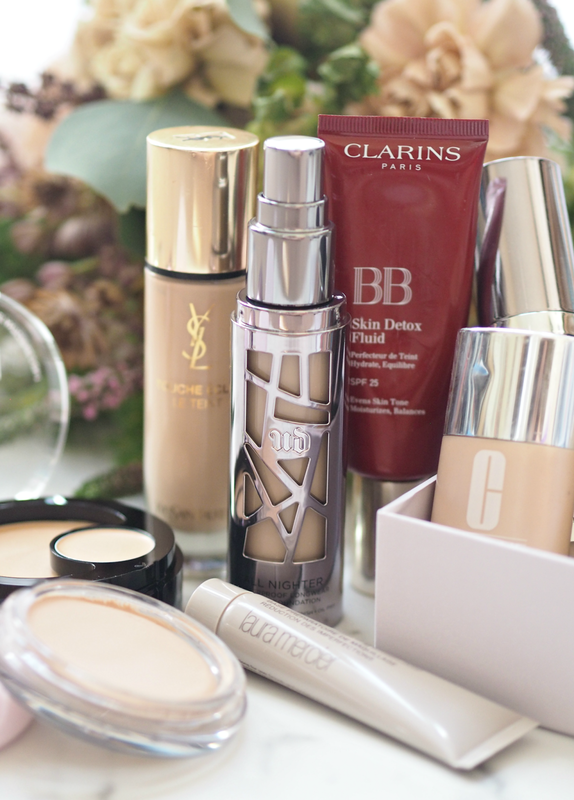 It took me a long time to get to grips with foundation, but even longer to understand the unique benefits different textures and formulas could offer; skip forward a decade or so and I have a plethora of different options within my repertoire that I turn to when in need of something to help me look my best. Whether that’s a high coverage and high performance base to help cover up a long week, a lightweight BB Cream to add radiance and help protect my skin from city living, or a dewy cushion foundation to offer a lightweight finish that lasts all day, I know how to navigate my way through. But do you? 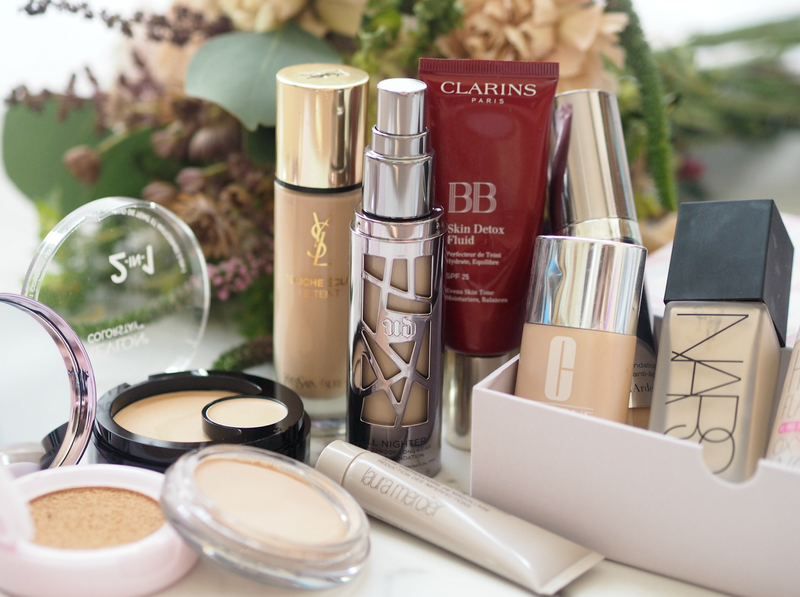 There’s no doubt picking a base can be confusing and overwhelming, so I’ve broken down the different types of product with advice on when to use them – as well as some of my personal picks and recommendations. I hope you find it useful! If you’re worried about pimples, discolouration, texture or generally the overall look of your natural skin tone, then a high coverage foundation is usually your best bet. High coverage doesn’t necessarily mean caking on a thick and heavy formula, as there are plenty of innovations that offer up a generous amount of coverage while still allowing skin to breathe. The level of coverage means it’s just easier to build up a result that helps to conceal all manner of imperfections, creating a more universal tone and boosting the wearers confidence. Additionally, high coverage foundations are great for nighttime when you want your makeup to stand out more – especially if you’re building a smokey eye or heavy lip look over the surface – as well as in the winter months when skin can look duller. Don’t be scared of the words ‘high coverage’; it’s just a way to describe the result of the liquid, not the thickness of the product. Perfectly suited for those that just want to create a more uniform base and even out any minor imperfections, lightweight foundations help to create a universal tone while keeping the finish light and fresh. I tend to pick these for daily use, as well as turning to them endlessly during Spring and Autumn, as they can help boost my natural tone without overloading the skin or making me look too ‘done’. More often than not, these types of formulas help to add radiance and a subtle glow to the skin; in turn this helps your complexion to look healthier and more natural, which is perfectly suited to the ‘no makeup makeup look’ so many of us desire. If you’re still concerned about little imperfections, then just dab on a concealer where you need it rather than covering your face in something too heavy. The product of a generation, tinted moisurisers were the way we all achieved a more lightweight finish back in the 90’s – before technology advanced enough to offer us decent foundations that didn’t overload the skin. If you’re more of a ‘wash and go’ type girl, then a tinted moisturiser may be all you need or want of a morning; by their nature they’re essentially a hydration product with a touch of colour, allowing you to add a very subtle boost to your skin without having to faff about with too much makeup. Great for lazy Sundays, beach days or when your complexion is simply looking hawt, tinted moisturisers still offer the modern woman something useful to have within her reportoire. Definitely the buzz product of the moment, cushion foundations hail from Korea (where seemingly they can do no wrong when it comes to skincare and makeup) but have quickly been adopted by more Western brands in the hunt for a new trend. These ‘compact-esque’ foundations allow application via a saturated sponge, which is dabbed using a brush or applicator to pick up just the right quantity of formula. Although it may seem like added faff, I can genuinely testament to the fact it does make a real difference; the result is lighter, fresher and more comfortable, without scrimping on coverage or longevity. In my opinion, these are a more modern alternative to a traditional lightweight foundation – so there’s no need to invest in both. Undoubtedly the foundation (excuse the pun) of the Bare Minerals business, loose or compact mineral foundations have become increasingly popular and more mainstream in the last ten years. Although they may have started as a way to offer coverage and a uniform finish to those suffering with skin conditions and acne, their benefits have quickly been recognised by the masses as a much lighter and skin-friendly way of wearing foundation. The loose powders are applied via circular buffing movements, leaving a very lightweight and almost undetectable finish on the skin; importantly it doesn’t look or feel like you’re wearing makeup (although I would always recommend skincare beneath or the powder can leave skin feeling a little tight and dehydrated.) Great for winter or for when you desire a more matte finish, this is a great way to achieve buildable coverage even when you’re devoid of skill. Possibly the most confusing of all makeup items, a BB cream is an all-in-one cosmetic product that essentially replaces serum, moisturizer, primer, foundation and sunscreen. Many women choose to wear this as it’s a much quicker way of achieving flawless skin as there’s no need for five different steps or products in the morning; one tube does the job of them all in one step. BB Creams often have anti-wrinkle, anti-inflammatory and soothing properties, making them great all-round products and a great alternative to a traditional foundation. The texture tends to be richer and creamier, so can often confuse the wearer until they become accustomed, but I can’t praise this format enough. Although I do personally tend to stick to these more in the summer months, if you don’t like your routine too complex or too heavy then BB Creams are a great way to look and feel great in minimal time. Designed to offer some of the benefits of a BB Cream, but with added colour correction qualities, CC Creams tend to be lighter and contain particles that burst to offer a perfectly matched colour result. Often containing elements of green, yellow or lilac to help counteract redness, dullness or sallow skin, these are great for those that have a fabulous texture but want to improve the overall tone of their skin. In my experience, finding a great CC Cream that provides a decent amount of coverage in addition to colour correction qualities is hard; if you’re concerned with discolouration, then you may also want to try CC crayons or fluids for a more targeted approach – before finishing up with a lightwight foundation over the top. Which formats do you personally opt for? Are there any other types of foundation you’re confused about or leave you feeling a bit baffled? Floral arrangement courtesy of www.beardsanddaisies.co.uk the ‘Letterbox Florist’. Get £5.00 off any bouquet using code LBQFLOWERS. This post was perfect, i'm on the look out for a new foundation at the moment !